This was a fun trip...and by fun I mean massive torture fest! I had a couple days between the time I dropped Stephan off at the Jackson airport after climbing the Grand Teton and meeting a few friends in Durando for a Weminuche trip so on my way down I stopped in the Uintas for a peak-bagging fest. I arrived at the Yellowstone River Trailhead at 11pm a short while after it got dark and started up the Yellowstone River trail. I had my sleeping bag, tent, some food, Ipod (which I needed) and my trekking poles for this 40 mile hike I so desired to do. 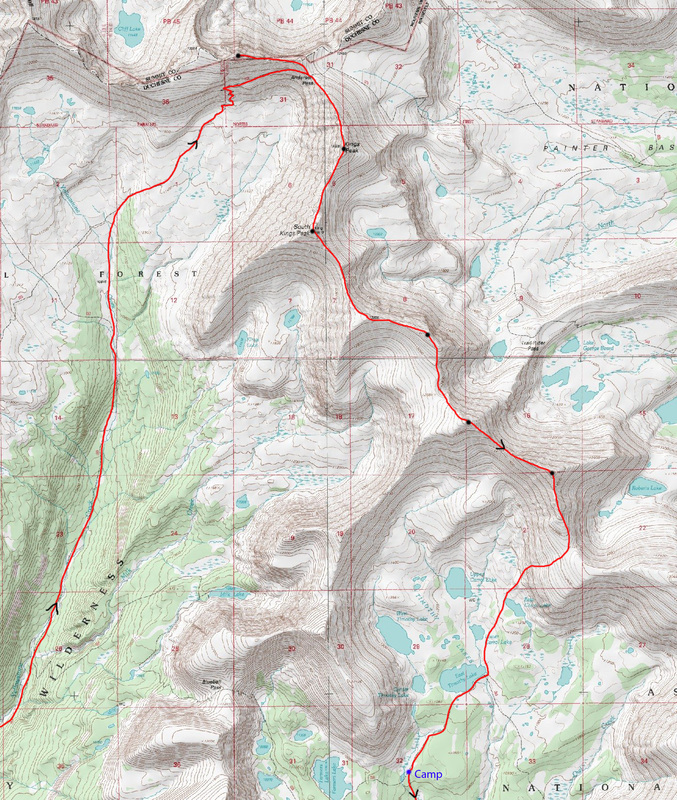 It started by hiking all night up the Yellowstone River Trail for 18 miles to Anderson Pass. This was one LONG hike and I played my music the entire time singing along in the dark with animals wondering what this idiot was doing! I remember passing by a big gorge but couldn't see much due to the new moon. The stars were quite nice though. The first light came when I was around treeline in one of the high alpine basins. I was shocked to still see swamplands despite the very dry year and the fact it was mid-August. I continued up the valley as the light became brighter and I was able to see peaks. I saw lots of wildlife including some elk, deer and marmots but no wildflowers. Much of the alpine grass was also no longer green. As the sun rose I made the final ascent up the nice trail to Anderson Pass. Here I took a nice break, dropped my pack and ran up Henrys Fork Peak which had a nice little scramble up its east ridge. The sun was still low so the lighting was pretty nice but to the west there was a dark layer of smoke covering the entire horizon which detracted from the beauty and made the sky look brownish. I returned to my pack at Anderson Pass where I saw another person to my surprise. Actually there was a few people heading up Kings Peak and I continued up the north ridge route which was an easy rock hopping fest to the summit where someone was already sitting. Here I got great views of the Kings-Emmons Ridge and saw how far I really had to go! It was a very long ways to Emmons and I was already exhausted from doing 20 miles already. But after a 20 minute break on the highest point in Utah, I pressed on to South Kings Peak. This traverse went smoothly and the second highest peak in Utah had an interesting perspective of the highest. As time went on, the smoke got worse as west winds carried it into the Uintas. I continued on to Trail Rider Peak after crossing over an unranked ridge-bump. The rocks on the ridge crest were flat and very wobbly..something I wasn't used to and on the traverse from Painter to Roberts Peak, a large flat rock rolled over and my foot slipped off and I banged my shin very hard on another rock causing a large piece of skin to scrape off. I sat in pain for a few minutes and wrapped a spare sock with some TP around it. 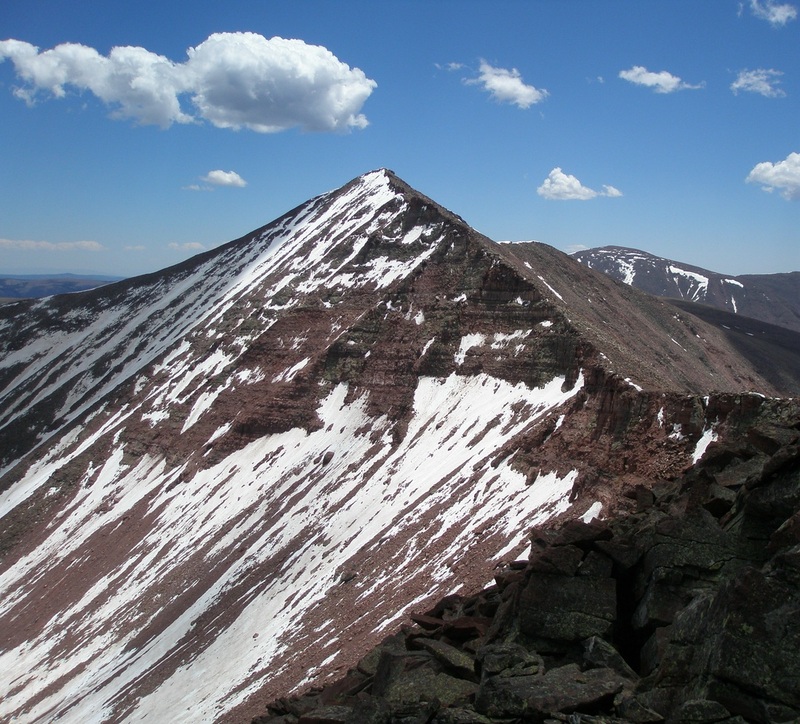 After heading over Roberts Peak and descending to the next saddle I was able to decide whether to continue on to North Emmons or descend to the Timothy Lakes. I really wanted to get both North Emmons and Emmons on this trip but when I dropped my pack and began climbing once again to North Emmons I only made it about 20 feet up before I realized it just wasn't going to happen. My legs were done from having done 25 miles to this point so I began descending down horrible talus to the west into the Timothy Lakes Basin. After slowly picking my way down loose rocks and passing through a break in the cliff bands I reached the nearly dried up East Carroll Lake. I wanted to get a little lower to the start of the trees to camp so I continued southwest down the valley towards East Timothy Lake. When I arrived at this lake I wasn't all that thrilled with all the orange coloring of the rocks that made it look like there was a man made dam put in here. I couldn't figure out how though as there was no evidence of a road anywhere. So I descended further and caught the trail I needed to hike back out to the car. I found a nice meadow near a small pond at the junction of the two trails and set the tent up. I was physically incapable of walking anymore and by the time I reached my camp I had hiked 29 miles. It goes down as the longest day mileage wise I have done and having 10 of those miles off trail on rough talus was hard. As I was cooking myself some dinner, a couple came up the trail and I was shocked to see anyone. I hadn't seen anyone since Kings Peak and the basin I was in felt very deserted. They approached and we started talking and to my surprise it was Gerry and Jennifer Roach! We had a very nice long conversation and they told me about some of their adventures. I had informed them about the peaks I just climbed and they were happy to talk with me. They wanted to head higher up to camp for the night. I slept like a dead log that night and didn't bother setting my alarm. The next morning I got up, tended my wound, and quickly packed up for the 8 mile hike out I still had ahead of me. This trail was heavily used by horses I could tell due to the poor grading and lots of rocks. After 4 miles it started raining and thundering and I thought how the Roach's were managing in this weather. After waiting a few minutes under a tree I passed the beaver dam area and the final 4 miles was quite pretty as the trail followed some nice ridges. The trail descended and met back with the Yellowstone Creek trail a half mile from the trailhead which I slogged passing by lots of cows the final bit to the car. This 2 day trip of mine I'll never forget as it was my first venture into the Uintas and will certainly be the last time I go there when there is no snow. The talus in these mountains I thought was some of the worst I'd been on...far worse than the stuff in the Elks of Colorado. I also want to avoid the smoke too so I'll probably go back in July in the future.